By trade, Dill Asher is a welder. But to those who've worked with the 44-year Hamilton Caster reigning veteran, he's the puzzle maker. A man whose calloused hands tell the story of the thousands of trucks and trailers he's pieced together like puzzles since 1967. When Dill was first hired at 24, there were two types of welders: Those who weld (type A), and those who can't (type B). He was type B. And so began Dill's story at Hamilton Caster, where he'd spend the next two years learning how to weld steel and handcraft any type of truck or trailer the engineers drew up. “Back then, things were different. We had two or three machines that ran off one motor, and we learned everything on the job," he said. “And we had 100s of people working in the factory. Today because of all the new technology, it takes less people to get a job done, but the teamwork formula is still the same." In the early 70s, when Dill needed to drill holes in steel rods to weld onto hand trucks, he'd use measuring tape and mark each spot where a hole needed to be punched. Today, he enters specs into a machine and it automatically stops at the right points to punch the hole. But that's about as much help Dill gets from computers. He's still as hands-on as they come. “Most of my day I'm taking all the steel parts that come from engineering and welding them by hand," he said. “Sometimes I'll get plans that look good on paper, but they just don't work, so I'll have to go back and collaborate with the engineers for a solution." 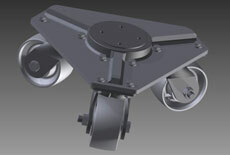 Dill's currently hard at work on another project to build model HM59 drum-handling trucks. And after 44 years, he has no plans of slowing down – especially since he hasn't missed a day of work for almost eight years. Does a three-headed monster of a caster purify seawater? No, but it does haul a 40,000-pound reverse osmosis purification machine that converts seawater into tap water. 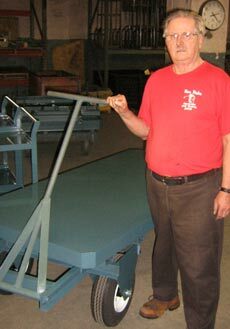 We recently built four custom, three-caster dollies to support the purification system. Because the end user often moves the machine around to new sites, we mounted it on four of the dollies (with three casters each). Each dolly has three Super Endurance™ (SEC) series kingpinless swivel casters with 6x3 forged steel wheels and precision ball bearings. 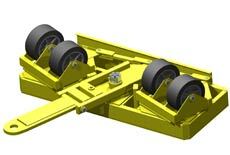 Each carries up to 15,000 pounds, with a total capacity of 60,000 pounds. The end result? A portable reverse osmosis machine that churns out 20,000 gallons of fresh water per day using 56 gallons of seawater per minute. 110,000 pounds: The largest capacity truck we've ever built moves over slippery surfaces at a refinery. It took two custom auto-steer running gear assemblies in the front and rear of the truck to handle this 55-ton wielding behemoth. The end user welded 30-foot-long I-beams onto the truck to bear the weight of the tanks. 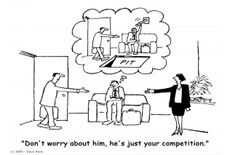 Most sales reps know everything about their competition. But even a seasoned veteran can learn a thing or two by sniffing out how their competition makes sales. 1. Who are your competition's unhappiest customers? Reps love to gloat about their largest and happiest customers, but they'll shove the unhappy ones aside. 2. How do they make sales? Find out how if they show demos, and how they make presentations. Equally important: Find out which stage of the pitch they make a proposal. 3. What's their view toward your company? Find out what they're saying about you. 4. What causes them to make or lose a sale? Use that knowledge to help your cause, or avoid making the same mistakes. When a major paper manufacturer lugs its enormous paper machine rollers around the factory, it relies on Hamilton Caster. The company needed trailers to handle the unique shape of the large tubes, so we constructed these trailers with their distinct “cradle" shape for the load to sit safely. 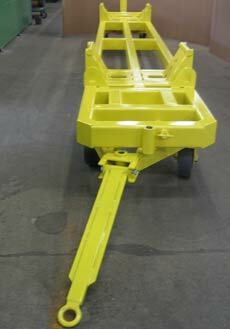 • Open-frame construct of structural steel tubing: 36" by 264"
• Load capacity: 12,000 lbs. Adu Dhabi is host to some of the world's premiere tourist destinations, like Burj Khalifa, the world's tallest building. Now, the country's best engineers have built the world's first circular skyscraper, and they've done it in less than three years.